← We’re Planting Trees – Can You Help? I always laugh whenever I see a seagull in Columbus as there’s not one bit of sea shining anywhere near central Ohio. I am more used to seeing them by Long Island Sound, which although full of salty seawater, is not the sea, as my husband, a native of Connecticut, is so fond of reminding me. Perhaps they should be called soundgulls instead? One of the things that the arboretum will do is bring a more diverse bird population into Clintonville. Pete says he’s noticed a lot more birds and insects around and thinks that it’s because, in part, of what we’ve done in the ravine to restore the native plants. I’ve just heard about another place near to Columbus that is also attracting birds, although birds that prefer open wetlands to closed woodlands: Glacier Ridge Metro Park, near I-270 and Route 33 in Dublin. The area was once part of the Darby Plains, lands that used to have a plethora of flora and fauna. By allowing water to come back into the park, a wetland was created that now has some fairly rare wetland birds visiting it. 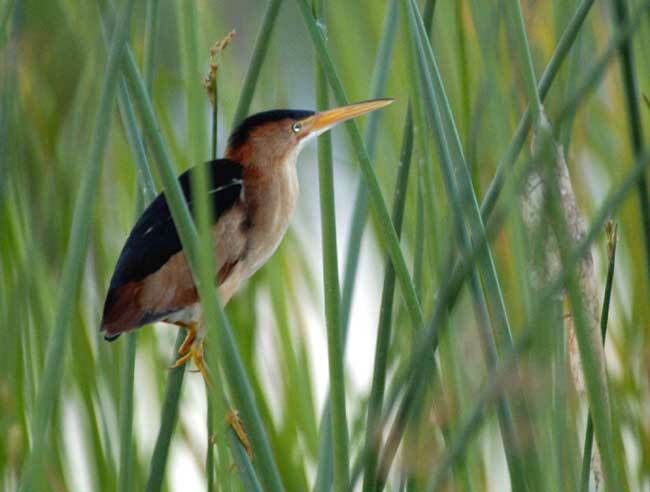 Some of the birds sighted include: the endangered king rail, the Virginia rail and sora, pied-billed grebes, American coots and least bitterns, the smallest heron in North American, pictured at the right. To be honest, all of the birds are not familiar to me. But it’s great that they have found a place to live and prosper. In other arboretum news, the plantings in the ravine on Saturday, September 24 went very well. Friends of the Ravines and the Lower Olentangy Urban Arboretum planted native trees and shrubs in areas where there were successful honeysuckle-removal events. Volunteers carried plants, dug holes, and installed and watered plants. These plants will now fill in the empty areas that were created when all of the honeysuckle plants were removed, providing appropriate food and cover for native wildlife. Thanks to everyone who participated; we would be lost without our many volunteers. The big news is that our first trees will be planted in tree lawns next week. More details as they become available – I am so excited! can make your site go viral easily using one tricky method. Hi blogger, do you monetize your lowerolentangyurbanarboretum.org ?